What were we created for? I sit in some church services and hear worship leaders saying we were made to worship. Others will say man was created to simply love God and enjoy Him forever. Still others claim we were made to go and make Christians out of the world. It’s apparent that there are a lot of different views of what we were created to do. I wonder if we were created to really “do” anything? Did God just create us because He needed servants? Does God really need anything? In this American society with its emphasis on doing we tend not to give much value to being. We even do worship by selling cases of books and DVD’s on how to do it right. Some focus some on liturgy, some on music, some on instruments and some on format. We even create new practices like teaching people how to channel the Holy Spirit, as though it was taught anywhere in Scripture, to crank up our “worship” in some way. In Genesis 1 I read the creation story and get to day six when God is crafting mankind. A word jumps out at me. “IMAGE!” I see that God creates in His image which means His nature, His character, His being. It seems to me that image is everything. That definitely is true of our image-driven society. But then I also know that fallen man dims God’s image in my life. My image is messed up. Sometimes I feel God’s heart inside me and I ache for others. Other times I am so focused on myself or being right that God’s character isn’t reflected in me at all. During those times I am like a bathroom mirror fogged by a hot shower; God is still there but His reflection is blurred in proportion to the amount of steam. I also see that God created me for His pleasure in Rev 4:11. We were created just because God wanted to create us. Colossians 1:16 tells us we were created by Him and for Him. God created us simply because He is God and that’s what He wanted to do. Period. I think we start getting weighed down when we attach strings to that truth. We attach a string of worship, a string of social justice, a string of evangelism, a string of attendance, a string of service and declare each string the very reason we were created. 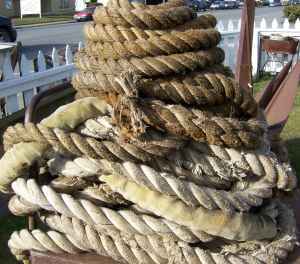 As each string is added we weave a pretty heavy rope. Do you know what I mean? Worship leaders promote their string, evangelists lift their string and Sunday school superintendents present their string. They are all good strings, I suppose, but together, they can become more of a weight than a lifeline. No doubt there is a lot to do in scripture. Singers sing, teachers teach, servers serve. We are commanded to go and make disciples, feed the hungry, clothe the naked and meet needs. We are to sing praises, clap hands and dance for joy. We are to learn and to study. Scripture has lots of things that will more than fill our time. Though it is confusing, all of the do’s are meant to be more the result of being than doing. They are the fruit of what we are. They are a byproduct of being created in the image of God and being about what He is about. When we focus on the doing and lose touch with the being. I wonder if ,by trying so hard to do, we compromise what we are created to be? Consider God. He introduces Himself as “I Am” and not as “I do.” The Lord my God is “One” meaning everything or all. We’re not His peers and He would be no different if He had not created mankind. Still, we are created in His image. When we become entirely about the doing we forget the totality of God. How can we define the indefinable? I long for my children not because I am supposed to be fond of them. I yearn for them because of what I am, their father. From the moment I first laid eyes on my newly born Joshua Abram, I was redefined. Acting certain ways did not make me a father but being a father impacted the way I acted. It was my being that motivated my doing. It seems like far too many of my friends are weighed down by a heavy rope of doing God things so that God will be pleased with them. I am not alone. It as though we hear a nagging voice saying, “If you really were spiritual you would do …” We would be at every church meeting and service, we would take every class, we would work in nursery and teach the children and then we would spend our weekends working with teenagers. We would serve on that committee, sing in the choir and be there for every work day. We would sign up for every mission trip, work the yardsale, bake cookies for shut-ins and serve at the soup kitchen. And we would definitely belt out those tunes on Sunday mornings and be in our seats on time and give a hearty “Amen!” at the appropriate times. And then … God would be pleased. Right? And, of course, if we could do even more than that He would be even more pleased. It would stand to reason. But it does not measure up to Scripture no matter how much we would like. Our comfortable competition communicates that some are more valuable, more holy, and more spiritual than others. Doing does that. Doing has tangible rewards. Doing brings praise. Doing brings position and status. When all the sap burns off, to use a New England maple metaphor, it all comes down to the sweet, sweet syrup of truth that God created us simply because He wants a relationship with us. He is more concerned with our being than He is with our doing. It is a life-altering relationship, no doubt, but it is first and foremost a relationship. I think we were created to live in the whisper.